Low Cost ‘Tuned-by-Design’ Injector-Diplexer Combiners for WiMAX-2600 / LTE-2600 and GSM-850 / 900 & LTE-700 bands. Microlab has launched a new product line of Low Cost Injector-Diplexer Combiners: BK-51. These 'Tuned-by-Design' components are able to separate or combine the new LTE-2600 / WiMAX-2600 bands that operate in a frequency range of 2400 MHZ to 2690 MHz and LTE-700 or GSM-850 / 900 bands, covering the frequency range of 698-to 960 MHz. With only 0.25dB of signal loss in all frequency bands, BK-51s guarantee very efficient signal handling. This excellent value is achieved through suspended substrate technology. Wolfgang Damm, Product Marketing Director of WTG says: "'Tuned-by-Design' eliminates the high cost of adjusting multiple cavities in conventional designs, while maintaining high 50 dB isolation between key bands, which is sufficient for most diplexer applications, such as sharing a common antenna or distributed antenna system". 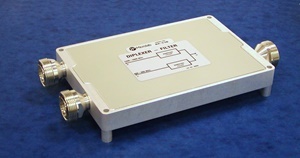 BK-51 Injector-Diplexer Combiners have very low Passive Intermodulation (PIM) values; very important to achieving optimal efficiency with modern high speed data wireless network technologies. The standard PIM value of a KB-51 is lower than -150dBc (measured with 2x20W carrier signals). For an additional testing charge, these components are also available with a guaranteed PIM value of even lower than -160dBc. BK-51 units are rated for average power levels of up to 150W per input port. This Injector-Diplexer is available with N (BK-51N) or 7/16-DIN (BK-51D) connectors. Samples are available for immediate evaluation from Microlab and selected distributors.